It's still a year until the iconic Beatles film "Yellow Submarine " turns 50, but plans for the celebration have already begun. The Apple Corporation is authorizing a comic book adaptation of the classic film with Titan Comics. Titan publishing director Chris Teather said of the forthcoming comic, "We're thrilled to be publishing The Beatles: Yellow Submarine for the 50th Anniversary of this fantastic movie. We can't wait for Beatles fans to experience this official adaptation." I might be interested in buying the Yellow Submarine comic book when it comes out. We could all request our local libraries to buy a copy. Rolling Stone has an article, but it doesn't add much. If it's just an adaptation of the screenplay, I can watch the movie. But if it's a different story, I might buy it. I think it will be the same premise but some things have probably been changed. If i see it in a store, i will definitely take a look at it. Hello, all! I'm on the train heading home from Comic Con, where today I attended the panel on the Yellow Submarine graphic novel. I was unable to secure one of the advance copies before they sold out, but we got a sneak peek during the panel with Bill Morrison, Andre Pepoy and Nathan Kane, and it is stunning! Faithful in reproducing the film's vibrant style. Afterward, we had an opportunity for a photo op with a life-size Blue Meanie (the person inside was a woman who said she was the only one small enough to fit inside). Then, there was a signing in the exhibit hall. 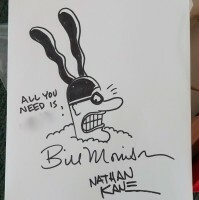 They had blank paper to sign and doodle Blue Meanies for those of us without comics, and Bill personalized mine with "All You Need Is [Parlance]!" Incidentally, they were taking pre-orders for the collectors' edition that is limited to a run of 1968. It was a lovely cap to the month's festivities, as earlier this month LA's Amoeba Records had a 50th bithday celebration with cake and giveaways preceding screenings at the Arclight Cinema across the street. Hopefully my photos will upload on train wifi. If not, I'll upload later. Thanks for the report, it looks like it’ll be fun. I’m a comic guy by the way. I’ll be getting this for sure. The Lennon NY Years graphic novel was also very good.